What might be a classroom of the future? How can we design existing space to be more dynamic? How might a space support different learning styles? How can we be more intentional about this “third space”? If a classroom were no longer filled with immovable desks aligned in rows, could it become a space that invited–even required–student collaboration, creativity, and critical thinking? What if the front of the room disappeared and students owned the walls–writing, wondering, and questioning? What if the physical space could be transformed in seconds, flexing to support the moment’s work? What if lesson plans gave way to student learning experiences where the student, not just the teacher, designed the curriculum and the learning? In conjunction with Cannon Design/The Third Teacher+, a school design consulting group in Chicago, and led by Laura Deisley and upper school dean of academic affairs, Marsha Little, the nine fellows have already engaged in significant professional development, as they focus on their role as designers–of curriculum, space, and student experiences. 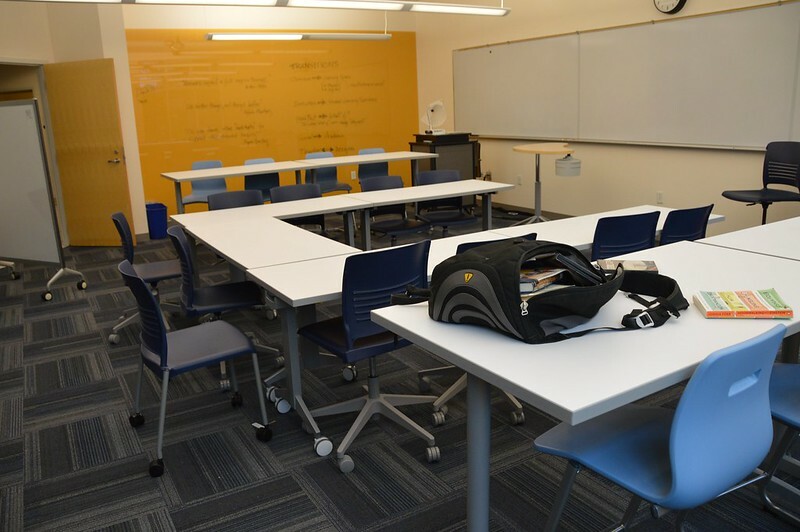 They’re teaching in renovated rooms with mobile desks, tables, and chairs; copious writable surfaces; and versatile technology. As the traditional boundaries of room ownership and discipline-specific hallways fade, we’re already seeing innovative collaboration between teachers and a breaking down of boundaries that seemed etched in stone. Ultimately, our goal is simple and unchanged: offer the best possible learning experience to students as they become excellent collaborators, creators, critical thinkers, and communicators. We are excited to explore how that work might be more fully realized in the Model Classrooms as the year unfolds. My fellow Norcross High School librarian Jennifer Lund and I were interested in the Lovett model since their work aligned with our vision for not only redesigning our physical space and the kinds of learning experiences we want our library to facilitate, but to also help us recast our roles here as instructional partners more deeply embedded in the day to day work of teaching and learning with our faculty and students as we aspire to craft a more participatory culture of learning, a vision that also aligns with our school’s literacy plan. Inspired by the work and vision of Brian Mathews at Virginia Tech and the model of Connected Learning, we envision the NHS library as a vibrant innovation hub of sorts to incubate, ignite and inspire larger change throughout our entire building, ultimately transforming learner experiences in a more seamless and cohesive way. As part of our strategic plan for the revamping of our physical space, we have proposed housing a prototype space for teaching and learning where we work with faculty and students to pilot, assess, model, and assess learning experiences. We want to enable our teachers and students to take risks as learners, to reflect and learn with them, and to help then share and distribute those insights across multiple content areas for cross-pollination of innovative strategies. 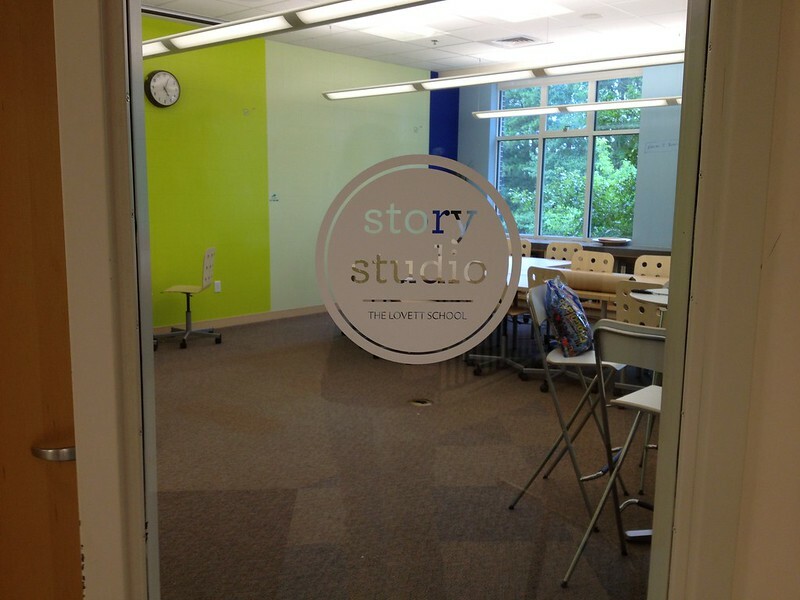 Because our vision paralleled the design drivers and physical design elements embodied in the six prototype classrooms at Lovett, we reached out to my friend and colleague Laura Deisley, the Director of Strategic Innovation at Lovett, to see if we could come for a visit and to have a conversation about their work. I know from my previous collaboration with Laura through Reimagine Ed that she is someone passionate about learning, libraries, and inquiry. Laura and Upper School Dean of Academic Affairs, Marsha Little, graciously accepted our request. Our visit yesterday, accompanied by friend and colleague Holly Frilot, Media Instructional Coach for our school district, was nothing short of energizing. As I watched students actively participating in learning experiences and discovering how the shift in physical space shifted teachers’ pedagogical stances, I literally quivered with excitement and joy—seeing how such simple yet profound changes were yielding impact and transformative learning experiences for both teachers and students was such a tremendous joy. In my previous experiences and now here at Norcross, I have sought to break down the artificial barriers that seem to separate libraries from their communities and create siloed learning experiences. The Lovett model reminds me that this scale of change is possible, scale that is needed to help our school grow into a learning community that embraces shared ownership of learning and connects contexts of academic driven, interest powered, and peer/mentor supported learning. Because the teachers float through the day from one model classroom to another, they do not have a teacher desk or other teacher-oriented paraphernalia plastered all over the room. Instead, the student handprint is embedded in each room with student created content; I find Lovett’s concept of learning spaces co-curated by students to be quite powerful and participatory as it invites collaboratively created content and honors fluidity in the roles of experts and novices by positioning teachers and students as co-teachers and co-learners. The purposeful and contextualized application of technology, rooted in learner needs and sound instructional design, was also refreshing. I heartily applaud the cohort’s willingness to engage in this kind of messy, organic work and to grow from the friction/cognitive dissonance that comes from being outside of one’s comfort zone. Variations in furniture styles and functions as well as heights for flexible seating and multiple types of collaborative work. Soft seating as well as hard seating were incorporated into the rooms. 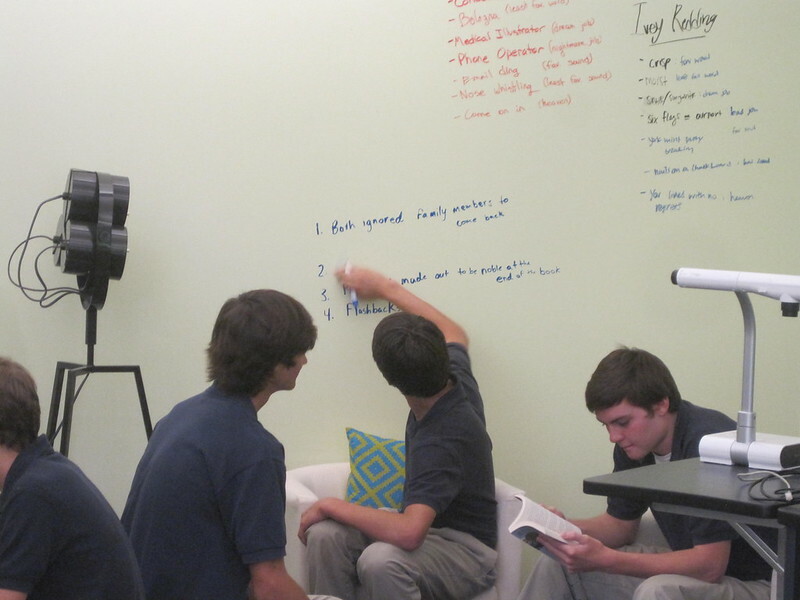 Writable surfaces: tinted glass affixed to the wall, mobile whiteboards on wheels (a favorite of the students and staff), IdeaPaint walls, writable tabletops. (note: Laura advises that if you are in an older building that has had multiple layers of paint or less than ideal drywall, you might want to consider the glass surfaces or mobile whiteboards (6 feet in length is optimal) since ghosting and the durability of the paint could potentially be problematic. “Zones” of rooms for smaller groups or paired conferencing. No teacher desk taking up the space. Students and teachers capture the student work each period with their cameras; Evernote is also a great app for capturing and sharing the content on the walls. Strategic lecture designed to facilitate, rather than dominate, the conversation, conversation that is fueled by students being contributors and active participants. Some teachers also time themselves to limit themselves to short chunks of lecture at a time. 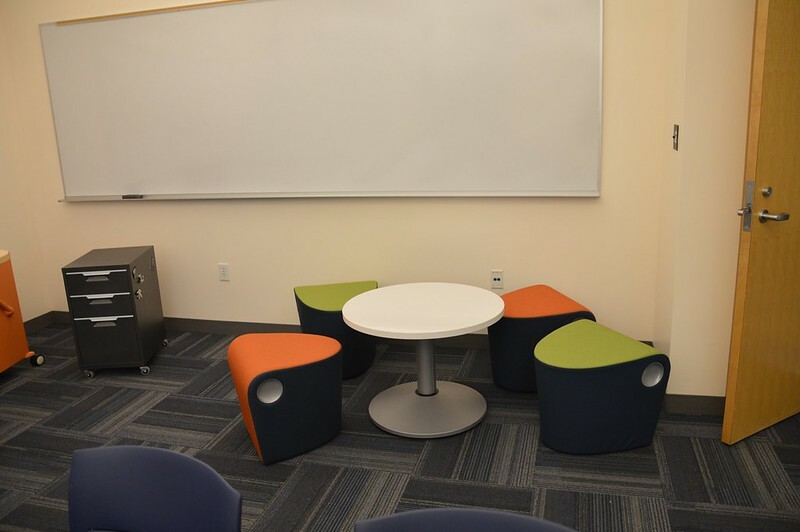 Rooms feel clean yet cozy; they are quickly and easily transformed since the space is open and supports transitions and reconfigurations of seating/workspaces/students. Time for individual reflection and work as well as active, collaborative time with small and whole group discussions/conversations for learning. Experiencing this learning ecology firsthand affirms our belief that our library can be the Story Studio prototype learning space for Norcross High; we see it as a springboard to future work in developing and working with a cohorts here to scale the pilot and more explicitly situate our work in the context of our classrooms. We are deeply appreciative that our principal, Mr. Will Bishop, supports this vision and the kind of work we want to do; we also appreciate the encouragement and feedback from assistant principal John Decarvalho and our LSTC (Local School Technology Coordinator) Dr. Victoria Dodd. By being a catalyst for designing learning experiences with our teachers and students that will meet our learners at their point of need, we can expand the possibilities for our library as both a learning space and a change agent that creates more diverse entry points for all learners, helps young people leverage the knowledge across multiple learning boundaries, and honors multiple ways of learning. We also see this an opportunity to more deliberately examine and expand the ways our library functions as a sponsor of literacy here at Norcross High. Ultimately, we hope to crowdsource with our students and faculty our own “learning playbook” that we can share with others as we engage in conversations for rewriting and composing new narratives of learning for everyone who is part of our learning community. A heartfelt thank you Laura, Marsha, the faculty, and students of Lovett for so generously sharing their wisdom and for giving us the opportunity to experience their learning ecology firsthand! The work that Buffy and Jen are doing at NHS will be nothing less than transformational. I am truly excited about their ideas of using space to affect pedagogy in positive and dynamic ways and feel privileged to have the opportunity to learn from them firsthand. As we discussed yesterday, I believe deeply in the opportunity for libraries to be catalysts, activators of contemporary teaching and learning, in their school communities. You have blazed the trail both in public and school libraries, and you and the Norcross/Gwinnettt County team have a wonderful vision and will lead us all yet again along a vibrant pathway. I eagerly await what will unfold! Thank you for your generous reflection, your very kind words, and the opportunity to have you as a colleague and friend. Poetry and Possibilities: Do They Live at Your Library?